Autumn is in full swing and with it has come the ripening of berries and fruits in hedgerows, parks, and the fringes of woodland. While it gives me a lot of pleasure to grow produce in the garden there’s something about slipping on a pair of wellies and hunting through the brambles that makes my inner hunter-gatherer jump for joy. 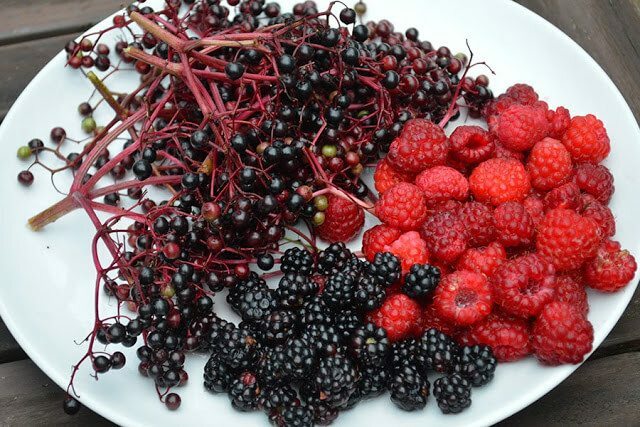 I’m clearly not the only one since foraging has become a trendy hobby and patches of rogue raspberries and thorny sloes are often kept a tightly guarded secret. Foraging this time of year is easy and relatively safe since even the slickest of city slickers will know what a blackberry looks like. With a little more know how you can even be lucky enough to go home with buckets of juicy Elderberries, plump Damsons, and tart Crab Apples. Please note that ‘Hedgerow Fruits’ will vary based on your region so be sure to consult a local guide before setting out on your expedition. 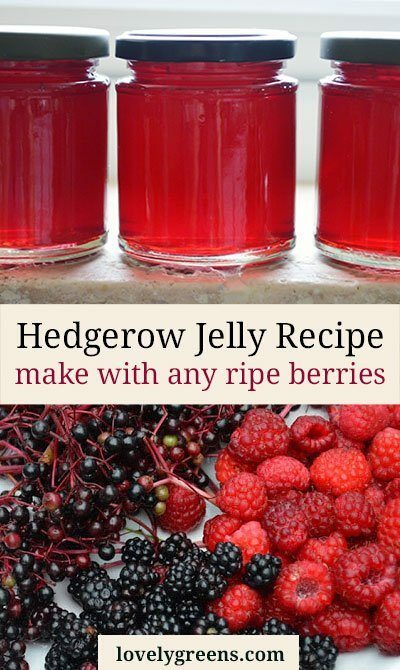 Foraged fruit can be used in all manner of preserves and desserts but one of the most classic and versatile is mixed fruit jelly often called ‘Hedgerow Jelly’. 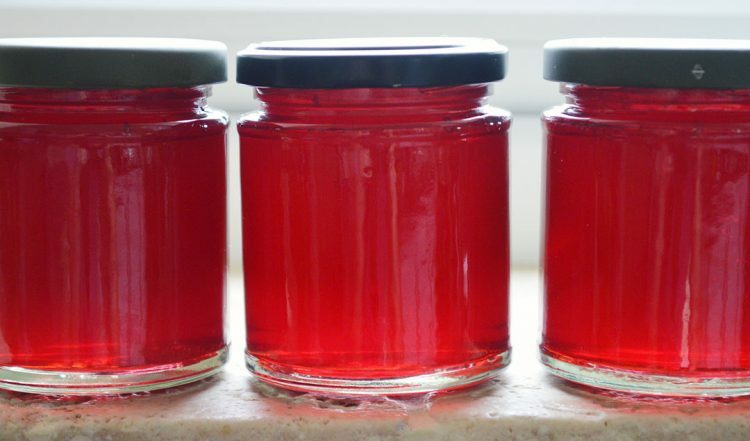 It’s a mixture of crab apples and two or three different types of berries of your choice – you can plan your jelly out to have specific flavours or just use what you had available. Yesterday I only found a handful each of Elderberries, Raspberries, and Blackberries and some old apples dangling from a canker ridden tree. On their own they weren’t very impressive but together they’ve come together to make a delicious preserve that’s loaded with autumn flavour and goodness. 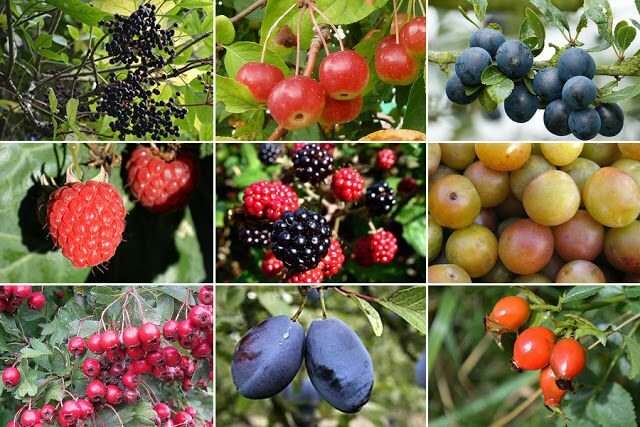 Some of the wild fruit found throughout Britain include (from top left): Elderberries, Crab Apples, Sloes, Raspberries, Blackberries, Bullaces, Haws, Damsons, and Rose Hips. 1. Rinse your fruit then chop up the apples and place them into a large sauce pan with the berries. Don’t peel or core the apples since the apples in this recipe are there to ensure that your jelly actually gels. Pectin is the magic ingredient in this equation and it’s concentrated in all the apple bits that you might normally discard. 2. Pour about 600ml (2.5 cups) water over the fruit and bring the contents of your pan to a simmer. What you’re aiming for here is extraction of juice and pectin from the fruit without boiling it to death. Keep the fruit on low and use a potato masher or stick blender to ensure the berries have released their gorgeous flavour into the water. This process should only take about ten minutes. 3. 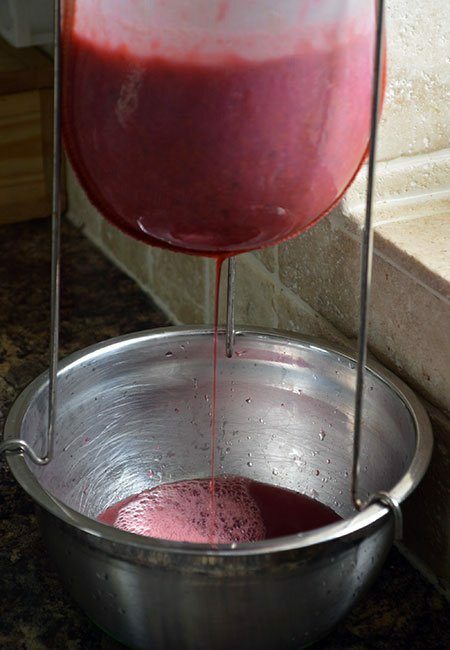 Set up your Jelly bag over a bowl and pour and/or spoon the berry-apple juice into the bag. Allow the juice to drip out for at least three hours but preferably overnight. Remember that if you squeeze the bag to try to speed up the process that your final jelly will not come out clear. Also, if you don’t have a jelly bag you can also use muslin or an old pillow case to strain the juice. Rig it up over your bowl with string – if I were using this method I might tie the contraption to the handle of a kitchen cupboard. 4. When the bag has stopped dripping, measure the amount of liquid you have in the bowl and the amount of sugar you’ll need then discard the contents of the jelly bag. For every 600ml (2.5 cups) of juice you’ll need 450g (2.25 cups) of sugar. In a large saucepan bring the juice to a boil then slowly add your sugar and stir until it’s completely dissolved. Leave the mixture to boil steadily for about ten minutes until you reach the setting point. For details on what to look for on the setting point please visit this link. 5. Take your pot off the hot hob and let it set for 30 seconds so that a skin will form on the surface of the jelly. Skim this off with any of the ‘jelly scum’ and then pour the clear hot jelly into warm and sterilised jars then seal. There’s no need to further process this jelly and the shelf-life will be at least a year. In castile soap and melt-and-pour soap, water is not listed in the ingredients list but sodium hydroxide is. Does that mean that water wasn't added and the lye isn't activated, or that water was added, it activated the lye, and then evaporated? Did they just not add water to the ingredients list because its not there in the final soap, even though it was used? Water isn't required to be listed since there's none left in the product by the time it's ready to use. Saying that, it's also not required to list Sodium Hydroxide thought many producers and soapers do. Instead you can list the soaps created by the different oils as a result of saponification. For example, instead of listing Coconut oil and Sodium Hydroxide you could list Sodium Cocoate, which is Coconut oil soap. Ingredient listing on soap can be inconsistent! Our first flush of blackberries were very good Tanya, but now they have gone seedy and not good at all. We have plenty of crabapple trees on our land and they are all laden but the elderberries are being taken quickly by the blackbirds. I think I would find it hard to find enough fruit for this. I love this! I've never thought of using all the bits and pieces; brilliant! No further processing in a water bath canner? Oh, hallelujah! I can make jelly and use the decorative little jars (similar to yours) with the tight fitting lids as opposed to the big old clunky canning jars I have! I make a version of this with rose hips, blackberries, tart apples and camberries. It's a jelly, too, and it is definitely one of our favorites. Which is good, b/c rose hip season is upon us here in the Pacific Northwest. I'm pinning this recipe for sure! Looks really good, we just don't have things like that around here, our berries are at the beginning of summer. Those jars look wonderful, like jewels or stained glass. You are right, there is huge satisfaction from finding food in the wild. I think it is a primaeval thing! 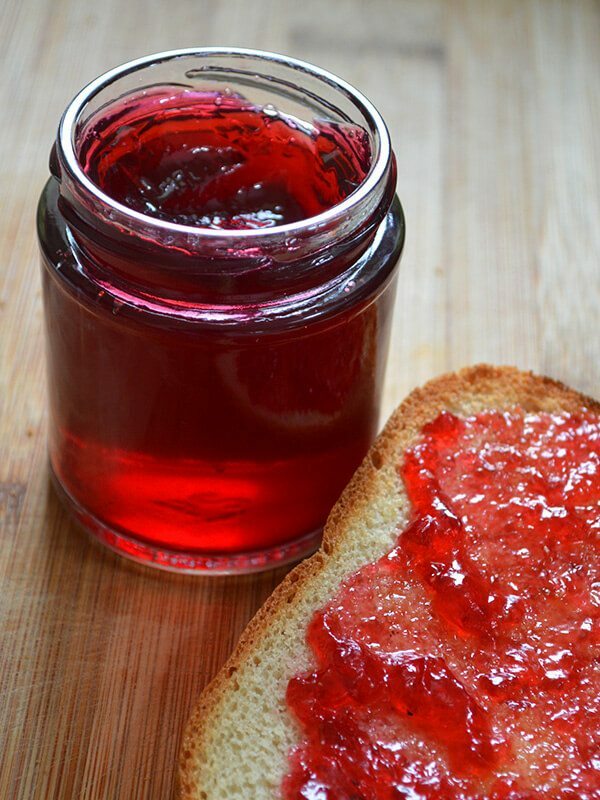 Can't beat a bit of home made jam. Even raw, the berries all look heavenly.